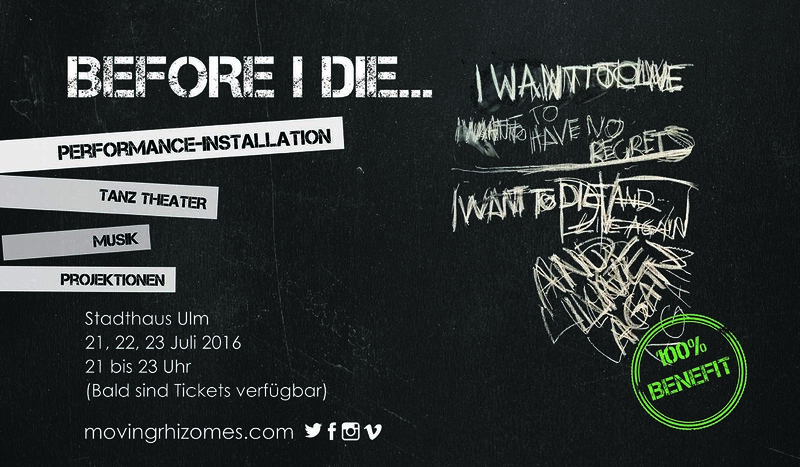 Before I die is a multidisciplinary dance, visual and music performance that took place in the Stadthaus of Ulm city the 21st, 22nd and 23rd July. Dancers, sound designers, musicians, visual artists, actors and refugees from different parts of the world took part on this event. It was an experience to your senses, a unique journey were visuals and holograms introduced hints of the refugee’s story. All this experience is supported by the special music made by Andreas Usenbenz. For this project to happen we went through a long process of research in different refugee settlements, from January on. Different workshops were done where we gathered information about the refugee´s story.100% of the money from the tickets was donated to refugee causes from Menschlichkeit. Here some images and details from the performance.